Pastor Rob joined Destiny in August of 2015 when he and his family moved to Colorado from Arizona. He brings with him 30+ years of pastoral experience and has worked full time in minstry since 1988. He is a graduate of North Central University in Minneapolis, MN and completed his Masters in Theology at Southwestern Assemblies of God University in Waxahachie, TX. Pastor Rob is married to his beautiful wife Kimberly who is an accomplished pianist, vocalist and music teacher. Together they have 2 children. Victoria who resides with them, and their son, Brandon, a worship pastor who lives with his wife Jessica in Southern California. Food : Is COFFEE a food group? - Espresso not the brewed junk - lol! Pastor is a Bean roasting coffee officianado and home barista! 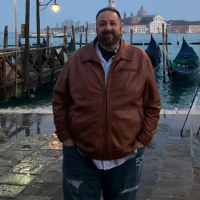 Pastor Rob has also traveled to England, Brazil, Venezuela, Paraguay, the Philippines and Italy doing missions work, and served as a chaplain and special teachers for Phoenix Christian Unified Schools. He also served on the board of Western Bible College in Phoenix, AZ and teaches with the Rocky Mountain School of Ministry.